Captivated by enamelled tiles and bricks used in Islamic buildings, Jane Dieulafoy's search in great cities and small villages, despite illness, religious fanatics and wild tribesmen, is an exciting story of risk and resolve. Blue-eyed Jane dressed as a boy to accompany her husband on digs in Persia, where women were veiled and enclosed. Her adventures led to the unexpected discovery of enamelled brick friezes in the 2500-year-old city of Susa. Displayed at the Louvre Museum, Paris, in 1886, the Lion and Archer friezes created a sensation and remain today among the Louvre's greatest treasures. The Antarctic Diaries of C.T. Madigan, transcribed by J.W. 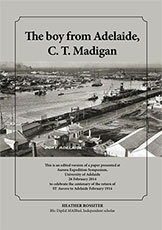 Madigan and published in 2012 as Madigan's Account: the Mawson Expedition, present a new perspective on the AAE 1911-1914. While the narrative of major events is familiar, emphasis and interpretation in Madigan's diaries undermine much of the mythology created around the expedition. This author has previously argued that during the Heroic Era diaries were the most authoritative form of reporting Antarctic experience. Madigan's dairies not only record his experience; unintentionally they also record his changing awareness as events modified the way he perceived and understood Antarctica and the expedition. Educators refer to changes in perception and understanding as 'learning'. Much of Madigan's 'learning' was painful. A diary is not only an authoritative record of experience; it is also a log of a changing persona as what is experienced transforms the self. In his diaries, Madigan both consciously and unconsciously reveals changes in his character and personality. The experiences that effected this transformation were sometimes tragic, others more benign. 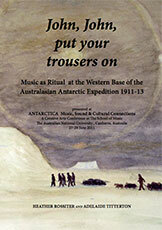 Although music was an integral part of the religious observance conducted almost every Sunday at the Western Base of the Australasian Antarctic Expedition, the AAE, it is not religious music, but music in the primary role of secular ritual that is the subject of this paper. Several definitions of ritual are considered and behavioural patterns at the base tested against them. Using these parameters, three rituals are identified. One began their day, a second marked the end of the week, and another of less regular occurrence initiated assaults on the Antarctic's secrets. Using diary extracts and other sources, the origins of each ritual are traced, its expression and affective dimensions analysed, and the psychological benefits deduced. The contribution of the rituals to the social harmony that was so much a feature of the base is evaluated. The centenary of the departure of the Australasian Antarctic Expedition (AAE), celebrated in Hobart on 2 December 2011, ignited interest in the documenting of 'Heroic Era' expeditions and of the AAE 1911-1914 in particular. 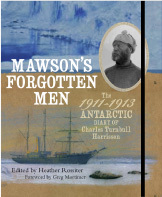 Simultaneously, the publication of artist and biologist Harrisson's diary as Mawson's Forgotten Men The 1911-1913 Antarctic Diary of Charles Turnbull Harrisson revived the almost vanished memory of the Western Base party of the AAE, an heroic group of eight whose endeavours bestowed reality on 2400 km of previously uncharted Antarctic coastline and legitimated the mythical Antarctic hinterland from 88° to 101° E Longitude. This paper argues that of the several forms of recording and reporting the experience and achievement of 'Heroic Era' Antarctic expeditions: diaries, scientific records, cinematographic material, still photographs and artworks, the diaries are the most authoritative. 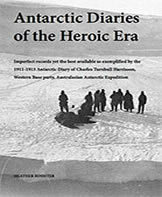 Mawson's Forgotten Men The 1911-1913 Antarctic Diary of Charles Turnbull Harrisson is more than a record of cold and courage; it is a 520-page love letter to his wife Carrie. Charles Turnbull Harrisson (1867-1914) was the only Tasmanian member of Douglas Mawson's legendary Australasian Antarctic Expedition 1911-14. Appointed biologist and artist to the expedition, Harrisson was a gifted writer. His diary of December 1911 to March 1913 records the challenges that faced the 8-man Western Base party landed on a glacier 2000km west of the Main Base, and their heroic achievements in Queen Mary Land. Transcribed and edited by Heather Rossiter, Harrisson's engaging narrative is complemented by his oil and watercolour paintings, pencil sketches made in the field and many photographs. In bringing Harrisson's diary from obscure library storage to published volume, Rossiter honours the daring spirit of these lesser known but equally audacious Antarctic explorers. 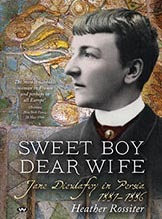 Herbert Dyce Murphy inspired Patrick White's The Twyborn Affair; he appears as a woman in one of E. Phillips Fox's best-known paintings; he prevented Douglas Mawson's Antarctic expedition from imploding. Lady Spy, Gentleman Explorer tells the story of one man's fascinating double life–a gentleman adventurer who also dressed in drag to spy for British Military Intelligence in pre-World War I Europe. In 1911 Murphy sailed to the Antarctic with the Mawson expedition for a gruelling exploration of the frozen continent, a trip of terrible hardship which claimed lives-probably unnecessarily-as this controversial view of Mawson demonstrates. 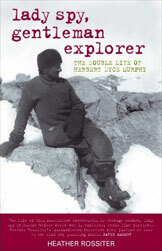 Brilliantly researched and beautifully written, Heather Rossiter's Lady Spy, Gentleman Explorer gives Murphy's unforgettable story its due at last. Using diaries held by the Mitchell Library [Rossiter] weaves an account of bravery, hardship and determination in the face of almost unimaginable odds. The gripping story of a fascinating woman, a history of Persia and a guide book for today's tourist.